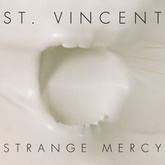 Listen to St. Vincent's top songs like I Should Watch TV, Ice Age, Cruel on EDM Hunters. 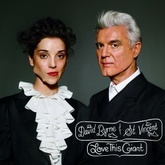 The list is updated daily to include all of St. Vincent's latest songs. The songs on this are ordered by number of likes, plays and downloads. Like your favourite songs to make your vote count. What's your #1? 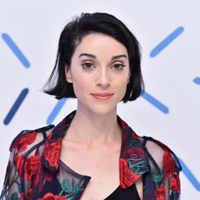 Annie Erin Clark (born September 28, 1982), known professionally as St. Vincent, is an American musician, singer, songwriter, and record producer. After studying at Berklee College of Music for three years, St. Vincent began her music career as a member of The Polyphonic Spree. She was also a member of Sufjan Stevens's touring band, before forming her own band in 2006. Her work has received consistent praise for its distinct musical style, which blends soft rock, experimental rock, electropop, and jazz influences. Her debut album was Marry Me (2007), followed by Actor (2009), Strange Mercy (2011), St. Vincent (2014), and Masseduction (2017). She released a collaborative album with David Byrne in 2012 titled Love This Giant. St. Vincent contributed backing vocals for Swans on their 2014 album To Be Kind. Her fourth solo album, the eponymous St. Vincent, was released that same year and was named album of the year by The Guardian, Entertainment Weekly, NME, and Slant, as well as second best album of the year by Time. The album won her a Grammy for Best Alternative Album, her first Grammy award. She was the first solo female performer in 20 years to win a Grammy in that category. In 2018, St. Vincent was included twice in NPR's "200 Greatest songs by 21st Century Women" at number 181 with "Digital Witness" and number 38 with "Cruel". Listen to St. Vincent's top and latest Dance, Electronica / Downtempo, Indie Dance / Nu Disco songs, watch videos and discover DJs similar to St. Vincent on EDM Hunters. Like your favourite songs to make your vote count. What's your #1?